There are numerous wood boring organisms which can be divided up into two broad groups: the wood boring molluscs (Shipworm) or crustaceans (Gribble). The Gribble resembles small underwater insects and degrades the wood from the surface creating small galleries on the surface of the wood, as shown in Figure 1.
b)	A pine wood sample after 12 months exposure showing typical attack by wood boring crustaceans. 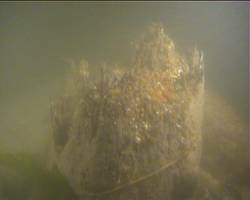 Wreck Protect is, however, particularly interested in the activity of wood boring molluscs (true Shipworm) in the Baltic. As opposed to the crustaceans, these organisms first settle onto the wood as minute larvae and thereafter bore into the wood and create tunnels, lined with calcium carbonate. From the surface, active wood borers can be very difficult to see, as it is only the small entrance hole which remains visible, if it is not obscured by seaweed and other matter. A typical shipworm is shown in Figure 2.
a) A typical shipworm (Teredo spp.) which is a wood boring bivalve mollusc. 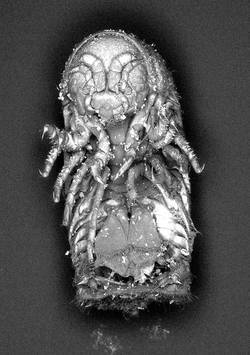 The individual was three months old and was ca 5cm in length. The calcareous shells, which bore into the wood are to the right of the picture. 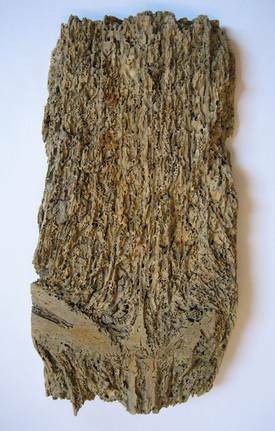 b) The outside of a piece of pine exposed on a wreck site for four months. Small holes can be seen but are difficult to distinguish in situ. Often on shipwrecks where shipworm attack has taken place, all that remains are the “stumps” of frames sticking up from the seabed (Figure 3) or when planking or frames are sectioned the numerous tunnels of the shipworm are clearly visible (Figure 4). 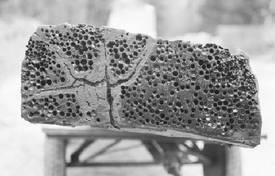 Figure 3: Archaeological wood standing proud of the seabed showing extensive degradation by shipworm. Help create an overview of the possible influence of shipworm in the Baltic.